The electronic exchange of business documents between trading partners has become a crucial part of running a modern business, but there are a variety of strategies for implementing EDI successfully. Many companies find that an in-house solution affords them the most freedom and flexibility, while also allowing them to maintain complete control of their data. Still, others discover that managing their own EDI data isn’t the most pragmatic solution. For these businesses, outsourcing data management to a third-party provider can be a sensible choice. In-house EDI offers many advantages for those willing to invest the time and resources into building the necessary infrastructure and putting a well-trained staff in place to manage it; however, this isn’t always feasible, and relying on a third-party EDI provider to manage the exchange of B2B documents also offers many benefits. The cost advantage of a managed EDI solution is one of the most immediately noticeable. With data handled off-site, there’s no need to invest in expensive hardware, software and maintenance contracts or employ a staff of dedicated EDI professionals. Reliable third-party EDI providers offer scalable solutions and monitor your data to ensure that transactions are completed and issues are resolved in a timely manner. Using a managed EDI service also allows companies to deploy resources in a way that lets them focus on core business processes instead of day-to-day data management, increasing operational efficiency and productivity. At the end of the day, EDI is designed to streamline your operations and a dependable managed service provider can help you do just that. Relying on a third-party provider to manage your inbound and outbound EDI data inherently requires giving up control – in opting to let EDI experts take responsibility for your data, you lose physical access to it. Not all companies are ready to take this step, but those that do benefit from simplified operations with minimal risk. Turning over control of your data doesn’t have to mean losing visibility into the EDI process. Even if your organization’s EDI data is managed off-site, being able to research and view transactions readily can prove critical to your operations and help to significantly reduce time-consuming phone calls between your company and your EDI provider. 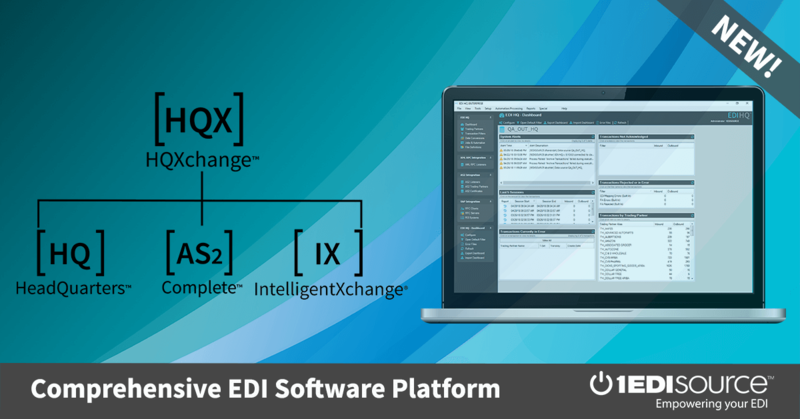 Through our own ManagedXchange™ (MX) off-site EDI services, 1 EDI Source offers users a web portal designed to provide them with access to their EDI data. This standard feature allows representatives from customer service, finance, IT and other departments within an organization to quickly see documents exchanged with their trading partners, using only an internet connection and a web browser. Furthermore, these documents are rendered in their native format and in plain English so that users who don’t “speak EDI” can verify that time-sensitive documents are mapped correctly and sent out on time. When performing searches using the MX portal, related documents are threaded together, making it easy for companies to pull up all relevant data for a specific transaction. Common documents like purchase orders (850), invoices (810), advanced shipment notices (856) and purchase order change requests (860) are returned, but so are harder-to-associate documents like the payment order/remittance advice (820) and EDI text messages (864). By providing users with quick access to inbound and outbound EDI data, the MX portal facilitates improved collaboration between 1 EDI Source and our customers. Contact Us to learn how managed EDI can help improve your customer relationships and streamline your business operations. Our EDI experts will talk you through the advantages of each type of EDI deployment.